Based on names used by Britain's royal family in the past, some experts believe that contenders might include Arthur, Albert, Philip or James. LONDON — What's in a name? Everything, when you're a royal baby. The arrival of the Duke and Duchess of Cambridge’s third child on Monday has left the world wondering what the new prince will be called. If recent history is anything to go by, Kensington Palace may opt to release the new baby’s name on Wednesday. Prince William and the former Kate Middleton made such announcements two days after the births of his siblings, George and Charlotte. However, Prince Charles and Diana waited a week to announce William's name. And the world had to wait even longer for then-Princess Elizabeth to reveal the name of her firstborn, Charles: an entire month. Philip would be intended to honor William's grandfather, Prince Philip, who has been married to Queen Elizabeth II for 70 years. Arthur, which is also one of William and Charles’ middle names, tops the lists issued by several British bookmakers. Betting chain Ladbrokes said James had attracted the most amount of money, with Alexander also seen as potentially being in the running. While such potential names may have long associations with the royal family, they are also among the most popular in England and Wales, according to the Office of National Statistics. James comes in at number 12 on the list of the top 100 baby names in 2016, the most recent year for which statistics are available. It is followed by Alexander at number 21 and Arthur at 30. The Cambridges appear less likely to use the most popular name, Oliver, given that it's reminiscent of the politician Oliver Cromwell, who signed the king’s death warrant in the 17th century. Kate, who has a close relationship with her family, may also want to reflect her heritage. Her father’s name is Michael and her brother’s name is James. Whatever name they choose for the prince, it’s likely to rise in the popularity rankings. The Cambridge’s choice of George for their first born helped boost it to number three, up from 12 the year before he was born. And Prince George and Princess Charlotte are anything to go by, the new baby will have more than one name. The royal siblings' full names are George Alexander Louis and Charlotte Elizabeth Diana. William, who is second in line to the throne, has four names — William Arthur Philip Louis. Outside of the immediate line of succession, the queen’s other children and grandchildren have chosen more modern names. William’s first cousin is called Zara, and she named her daughter Mia. William’s other first cousin, Peter Phillips, who has no royal title, named his daughters Savannah and Isla. 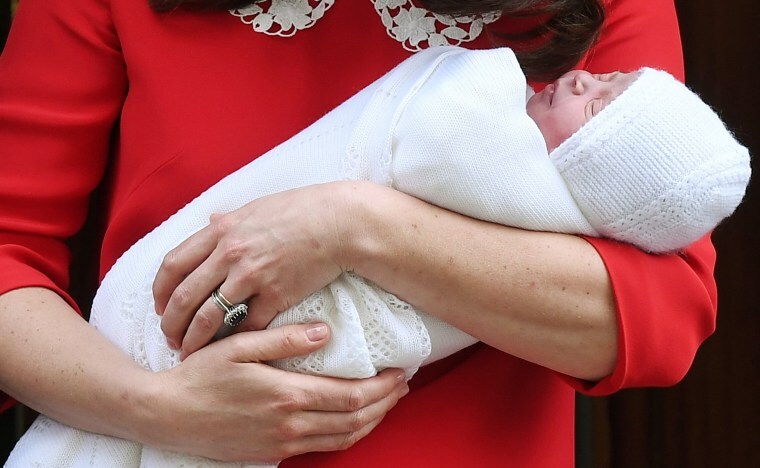 Whatever his name, the new baby’s official title will be styled the same as his siblings: Prince (name) Cambridge. He is fifth in line to the throne.